When it comes to branding, social media is now the great word of mouth companies need to promote themselves in the marketplace successfully. More than just forums for direct interactions with your customers, these platforms provide an opportunity to express what’s behind your products and services-the core values that drive your business. In 2013, great branding is achieved through a social media campaign that connects the right message with the right consumers. A recent study by analysts at Unmetric revealed the most popular corporate Pinterest boards were ones that took advantage of Pinterest’s mostly female demographic. Two boards created by Better Homes and Gardens, for example, had the most repins by consumers, as well as the second and third most “likes” of any company on the social media site. The Better Homes and Gardens boards in question feature “guest pinners” regularly, and accrue many comments from consumers themselves. They provide multiple opportunities for users to share interests and opinions about the things they care about in these subject areas. Along with support, the pins from Better Home and Gardens provide inspiration for one’s entire home environment and lifestyle, not just the products and services that happen to be featured that week. That kind of identification, that connection between the products you’re trying to promote with a larger value message, is precisely the definition of good branding. The good news? Any company, big or small, can take advantage of this kind of opportunity with a great social media campaign. By now, your competitors are definitely on board. Are you? The Internet is constantly changing, and without an agile online marketing strategy, your business will get left behind. Take Pinterest, for example. Recent studies have demonstrated that consumer participation is at all time high on the world’s third most popular social network. In fact, “pinning” in some brand categories is led by consumers themselves, rather than companies within that area. This is a golden opportunity for businesses to engage with these consumers, showing off products, services, and a point of view that connect with a huge audience of potential customers. Captain Marketing can help you choose not only the best times to post (schedules that are quantifiable for many industries) but also to select the right images that will proliferate across the web. Pinterest is clearly here to stay. Take advantage of this popular platform and stay ahead of your competitors. Savvy online marketing is the key to your success in 2013. We like to keep things exciting here at Captain Marketing…and we also understand that even when you’re saving a bundle on the results-focused marketing services we offer, it’s nice to save even more. That’s why from now on we’ll be offering a weekly promotion that will allow you to boost traffic and increase conversions, either as a new client or just by adding new services to your existing account with us. Check back every week for news about our great deals. Double Deal Week is here! Sign up for a new Social Media Optimization service, and receive double social media posts for the first month. All customers who sign up for new SMO packages will get double posts, for double the interest and engagement with your consumers. The more you sign up for the more value you get with this Double Deal Week promotion. Social media is becoming more and more important in marketing your business. From SEO benefits to customer acquisition, a social media presence has moved from cutting edge to a necessary part of any business strategy. 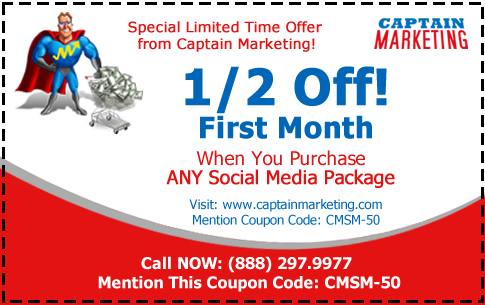 At Captain Marketing, we help you create the online presence you need to be competitive. 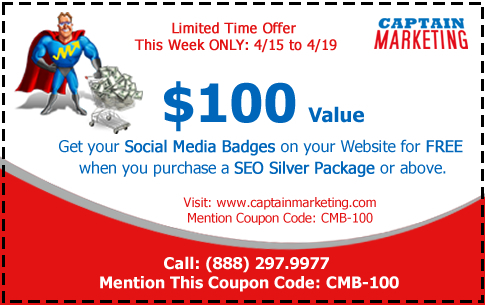 With double deal week, you get an extra boost to your social rankings when launching your social media campaign with us. Enjoy with our compliments and see the results make a difference to your bottom line. According to a report in the Deseret News, major retailers are now making major inventory decisions based in part on the results of social media polls and Facebook “likes” they receive from customers on various products. For the first time ever, Wal Mart allowed customers on the one-billion-strong social media site to vote on which toys they wanted put on sale for the Christmas season. Similarly, Macy’s customers recently voted on Facebook for more jeans in neon hues, rather than pastels-a decision the company buyers acted upon immediately, rolling out a “Very Vivid” collection of brightly colored denim in response. Some good news for those businesses who use social media marketing: Forrester Research, an independent global research and advisory firm, has released a recent study that shows 79% of Americans online are accessing the Internet daily, for more longer periods, and most importantly, are interacting with their favorite brands more than ever before. The report also states that 45% of people on social networks say they have interacted with a brand through social media over the past three months. Pointing to the increasing mobility of the marketplace, the study also showed tablet ownership has more than doubled since 2011. Why You Need To Be On Twitter, Today! When even the Curiosity spacecraft tweets reports from Mars to schoolchildren everywhere, you know Twitter has indeed arrived as a powerful social media platform. As of September 5, 2012, according to the Huffington Post, there are more than 500 million active, registered Twitter users, with 1.6 billion search engine queries about the social media platform every single day. Clearly, tweeting is no longer just for the birds, though Rudy, a small orange parrot tweeting from Silver Springs, Maryland, might disagree. In fact, the whale at the Museum of Natural History in New York City tweets weekly updates, as can your houseplants, courtesy of a product at botanicalls.com that you insert into the potting soil. When the plant gets dry, the sensor allows the philodendron in question to tweet a request for more water. 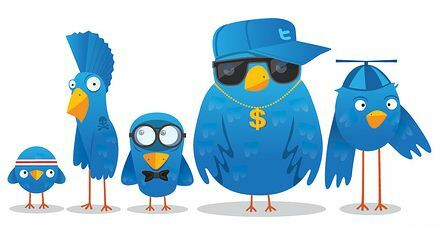 Other weird but popular twitter accounts include a human liver, a ghost cat posting from the Great Beyond, and of course, we haven’t even mentioned popular “celebrity spoof” twitter accounts (not to be confused with say, the obviously very legitimate tweets from a vital organ or the bird). With fake but funny (depending on who you ask) accounts for everyone from Queen Elizabeth to North Korea’s Kim Jong-un, the medium is clearly ripe for just about anyone with something to say and several times a day to say it. Given these ever expanding creative parameters, you may ask, how can your company’s twitter account compete effectively on this platform? It’s possible-and worth the effort. Essentially, Twitter lets you connect with customers by providing meaningful information and commentary anywhere from several times a week to several times a day. Rather than being just another place to advertise with a “buy this widget” message, Twitter offers a chance for potential customers to build a relationship with your brand, not just your product. And that, perhaps, is the key to Twitter’s huge success. 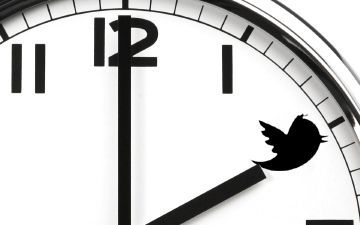 An effective Twitter account starts with when, where and how you tweet. First, remember short tweets under 100 characters always receive more attention than long ones. Secondly, time of day and time of the week matter too. Did you know tweets on a weekend afternoon are more likely to be retweeted than those on a weekday morning, according to the market researchers at Buddy Media? Just asking for a retweet also makes a significant difference in engagement rates, with this simple call to action alone resulting in a 12% increase in customer participation, according to the same Buddy Media study.